The World's first in depth book on the history of the Christmas Cracker - From 1840's to the Present. Author Peter Kimpton, in his new book entitled “Tom Smith's Christmas Crackers” brings you an in-depth history of Tom Smith the man, his accepted invention of the Christmas cracker, his associated products, competitors, many re-discovered facts and images and much, much more in his wide ranging coverage of the subject. 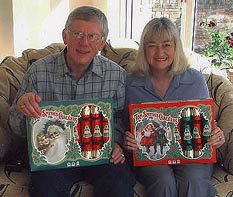 After a number of years within the Christmas Cracker industry as Marketing Services Manager with the Tom Smith Group in Norwich, England, during which time he was responsible for much development work on both modern and traditional interpretations of the Christmas cracker, Peter was well placed to write a book on this subject. This experience coupled with a chance discovery of a quantity of wonderful Tom Smith archive material in the 1990’s dating back to the 1880’s, not only gave him the idea to write this book but has enabled him to offer the reader a fascinating insight into the world of crackers both past and present. “To my knowledge, this is the first ever really comprehensive book on the subject which introduces you to the fascinating history of the Christmas cracker and associated products”. “My researches have unearthed much as yet undiscovered material from far and wide and in particular from my own Kathleen Kimpton collection here in Norwich which is not generally available to the public.” Say's Peter. The author’s own experience and archive material is interestingly supplemented by first hand accounts from several stalwarts of the cracker industry of long ago. And so if you are in any way shape or form interested in the invention and origins of the great English tradition - the Christmas cracker, then this book is most definitely for you. For any information regarding Christmas Crackers in general, the book (which will be personally signed and dated by the author), his Educational folder and limited edition prints. If you’ve ever wondered about the origins of the Christmas Cracker then this book is one not to miss. ALL YOU COULD WISH TO KNOW. From the UK’s leading expert on the history of the Christmas cracker, author Peter Kimpton brings you his fascinating, in depth history of Tom Smith the man, his accepted invention and the Christmas cracker industry since the 1840’s - in theUK, Europe and North America - featuring hundreds of as yet unpublished facts and many illustrations. After several years research, I am at last able to offer a comprehensive history of the man and his accepted invention, covering the development and spread of the Christmas cracker both here in the UK and around the world as far as it is known.Apart from the basic history of Tom Smith, from when he first set up in business on his own in the 1840’s, my book, amongst other things, covers his wonderful box graphics, his company’s competitors, mergers, takeovers, wartime factory destruction and personal reminiscences of skilled and knowledgable people who have worked within the cracker industry over many years. Did you know that the great English artist A.J. Munnings actually designed cracker boxes in his youth? Have you ever heard of “The Castle of the Cracker King.” What contents go into the Royal crackers? Read about the crackers produced for Prince Charles and Princess Diana’s wedding. What do know about Snaps and Scraps or "Animates" crackers-created in conjunction with the famous Wade Pottery, producers of the renowned "Whimsies". How about love Mottoes and Corny Jokes? 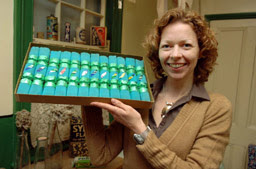 Could some of the Tom Smith’s box designs be classed as racist? If you are in any way interested in the great English tradition of the Christmas cracker, then this book will tell you all you need to know. THE contents of 60-year-old Christmas crackers have finally been revealed. An X-ray has been taken of the 1940s crackers which were found in a dusty corner of a recently closed newsagents in York. Since then they have been held in the conservation laboratories of the York Archaeological Trust where they were X-rayed. Items include a Scotty dog brooch, a flower pin brooch, a toy bell and a tin whistle. They also contain brass lapel badges in the shape of aeroplanes, paper hats and jokes. 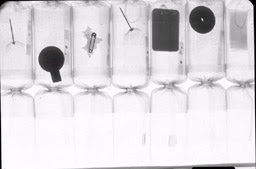 The crackers and X-ray have now been donated to the Castle Museum in York. Sarah Maultby, assistant curactor of social history said: "These crackers are an excellent find and we are very pleased that the YAT have donated them to us. "The different boxes are all in great condition and by x-raying them we have a record of what is inside without having to destroy them. They are a brilliant addition to our festive collection." The crackers donated to the museum are two different makes, Golden Gate Crackers in a flat oblong box, and Universe Xmas Crackers in a deeper square box. There is no indication on either packaging of when or where they were made, though the latter had a pencilled price of 8/6d on the lid. Last year I appeared on BBC1's Question of Sport Christmas Special making crackers with a famous tennis star. I am offering a box of 6 luxury crackers to the person who can name that 70's tennis player. He appeared in two Wimbledon Men's Finals, once 1972 and another in 1976. He is a nice person but can be quite 'Nasty' sometimes. Entries should reach us no later than 12th December 2006. First name out of the hat will win. Good Luck! * You will also be contacted by email asking if you would like to join our mailing list which informs you of offers and competitions from only us at Absolutely Crackers. To unsubscribe you will just need to click on the link provided. Your email will NOT be passed on to any other party.